Arch Auto Parts customer-first web design and OE-brand partnerships elevate NY online and retail parts sale. Most orders ready for pick-up in 30 minutes; all 50,000+ OE-quality, low-cost auto parts available within 3 hours, the fastest availability in New York. New ArchAutoParts.com provides NY's best selection of OE-quality, discount parts, with fastest availability. Most orders ready for in-store pick-up in 30 min. Now most customers can buy the OE-quality parts they need online, and their order will be ready for pick-up as fast as they can drive to their closest Arch Auto Parts store. 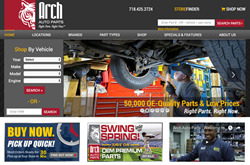 Arch Auto Parts, a leading aftermarket auto parts supplier in Brooklyn, Queens and Long Island, NY, has launched a retail e-commerce website that provides New York's widest selection of OE-quality, low-cost parts available for quick, same-day pick-up. All of Arch Auto Parts' 50,000+ high-quality aftermarket automotive parts are available to buy online, with most orders ready for pick-up at customer's selected store in 30 minutes or less. The new ArchAutoParts.com site is built in three main sections, to reflect three unique advantages Arch Auto Parts brings NY retail parts shoppers. Most online auto parts websites require shoppers to search for car parts at only one store location at a time, which is frustratingly slow for shoppers who need parts quickly. If the part is not in-stock, they go back to the map, select another store, and start their search over again. With Arch Auto Parts' Buy Now. Pick up Quick™ shopping, New York shoppers can instantly see all Arch locations where parts they need are in-stock, eliminating time-consuming searches at multiple stores. If a part is not already in-stock at customer's selected store, but is available at any Arch store or warehouse, they can still buy the part online, and Arch will have it at their store, ready for pick-up within 3 hours. This direct-to-store delivery is free to customers, greatly expands same-day availability, and eliminates days or weeks of delivery time from traditional online channels. The Arch website also brings a unique brand focus, so customers can see clearly all the OEM and OE-quality brands available for the parts they need, as contrasted with store brand dominance typical of national chains. Through dedicated brand pages and helpful information throughout the site, shoppers can easily learn more about the suppliers, specials, product features and benefits. Arch Auto Parts carefully selects suppliers who consistently provide the highest quality and the highest value for our customers. "Usually, someone is already under the hood and half-way through a repair before they know which parts they need," said Chris Bodh, CEO, Arch Auto Parts. "They don't have time to search all over town, or wait days for delivery. They need parts that fit their vehicle―right then. We restructured our business so most customers can buy online, and their parts will be ready for pick-up as fast as they can drive to their closest Arch Auto Parts store." All ten neighborhood Arch Auto Parts stores have their own dedicated web page, to highlight their personality and foster closer neighborhood connections. Arch Auto Parts' locally owned and managed stores are committed to serving their neighborhoods in Brooklyn, Queens and Long Island. With an average of ten years' experience, Arch countermen are parts experts, who listen to customers and provide the exact-fit parts they need. Over 90% of Arch Auto Parts' business is from repeat customers. The site features an online parts catalog, including part fitment information, so users can easily find parts that fit their specific vehicle. To extend Arch's experienced counterman expertise to online shoppers, Arch has staffed a new Arch Online Team of experienced parts experts, to help customers in English and Spanish. The team is available by phone and online chat, to help customers determine which parts will work best for their vehicle and get the "Right Parts, Right Now™". "As an Original Equipment Manufacturer with more than 140 years auto parts experience, we really appreciate the extra value Arch brings to market with this website- as well as in-store," said Tom Lee, North America marketing manager of Continental’s Automotive Aftermarket Business. "We are proud to partner with Arch Auto Parts, because they understand the value of high-quality parts, and the importance of helping their customers get exact-fit parts that last." The SEO-enhanced site is mobile-friendly to help parts shoppers near our stores in Brooklyn, Queens, and Long Island, as well as shoppers in the Bronx, Manhattan, and Staten Island find the same-day parts they need. In addition, the site features a quick-search store finder, to map and give directions to the closest Arch Auto Parts store. Founded in 1979, Arch Auto Parts' ten locally owned and operated stores in Brooklyn, Queens and Long Island, NY, serve professional service and repair shops as well as DIY mechanics and auto enthusiasts. Arch Auto Parts delivers unsurpassed customer service and discount prices on a wide selection of OE-quality auto parts from AC Delco, Aisin, Akebono, Anchor Doan, AP Exhaust, Arc, Auto 7, BCA / NTN, Bosch, Centric, Continental, Denso, FCS, Fram, Gabriel, GMB, Mahle, MAS, Motorcraft, MPA, NGK, Pex, Sachs, Standard, Stant, Sylvania, Timken, TRW, TYC, VDO and other trusted brands. Arch Auto Parts stocks more than 50,000 OEM and high-quality aftermarket auto parts for domestic and foreign vehicles, including brake pads, drums and rotors; wheel hubs and bearings; motor mounts, chassis and control arms; steering and suspension parts; cabin filters, oil filters, fuel and emission filters and manifolds; sensors and switches; timing belts and water pumps; ignition, batteries, starters, alternators and distributors; heating and air conditioning; and hard-to-find car parts such as window regulators and wiper motors. Arch Auto Parts is open seven days a week with experienced counter staff dedicated to helping New York customers find exactly the parts they need. For more information, visit us at http://www.ArchAutoParts.com or call 718-425-ARCH (718-425-2724).